I was recently tagged by Erica in her blog for something called the Writing Process Blog Hop. As a writer, I thought it asked some good questions and would be intriguing to answer :) Here goes nothing! My current focus is on a project called Chronicles of the Sentinels. This represents the beginning of at least a trilogy of novels, although I’m already coming up with ideas for stories beyond the initial trilogy! The central characters are three ordinary college students who are caught up in the struggle to preserve a mystical barrier that blocks all magic from Earth. Chronicles of the Sentinels is a modern-day fantasy, and while those are becoming increasingly popular these days, the path it will take is somewhat unique. The premise is that magic is real, but thousands of years ago, to prevent a Babylonian god from coming to Earth to conquer humanity, the Sentinels, a group of extraordinarily powerful wizards, came together and built a barrier that blocked all magic from Earth. Fast-forward to today, and Marduk’s half-human son Nabu makes a final attempt to bring down the Barrier…and succeeds! So imagine in today’s society that magic, once thought to be flights of fancy or heretical, suddenly becomes very much real. How would this impact society? How would this impact individuals? While telling an exciting and fun adventure tale, these topics will be explored throughout the trilogy. Why I write in general is covered in my About page, but why do I write Fantasy? That’s actually a very good question, one which I haven’t thought much about. Fantasy has been a genre that has always intrigued me. 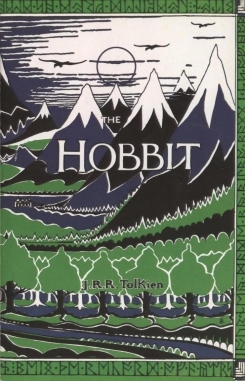 While the first movies I remember watching were science fiction (Empire Strikes Back and Star Trek 3), the first real, proper novel I remember reading was The Hobbit. Even before then, children’s books filled with magic and mystical creatures always enchanted me. So now I wish to forge my own tales in that fantastic, imaginative genre! Furthermore, just like with Science Fiction, Fantasy is a genre in which writers and their readers can explore very deep, very important concepts of humanity in an engaging way. Who are we? Why are we here? What is human nature? Why? All of these can be explored without boring the reader, and you never know the impact your stories will have on their own lives! I covered this in-depth in a two-part blog article (Click here for Part 1) but I do have a somewhat structured process that has really helped me with novels. The first part is what I call pre-writing, and that is all of the work involved before actually writing the manuscript’s first draft. This includes brain-storming, researching, character development, location development (such as map drawing), culture development, everything you should do prior to starting a new project. Much of the development is written down by hand in journals. 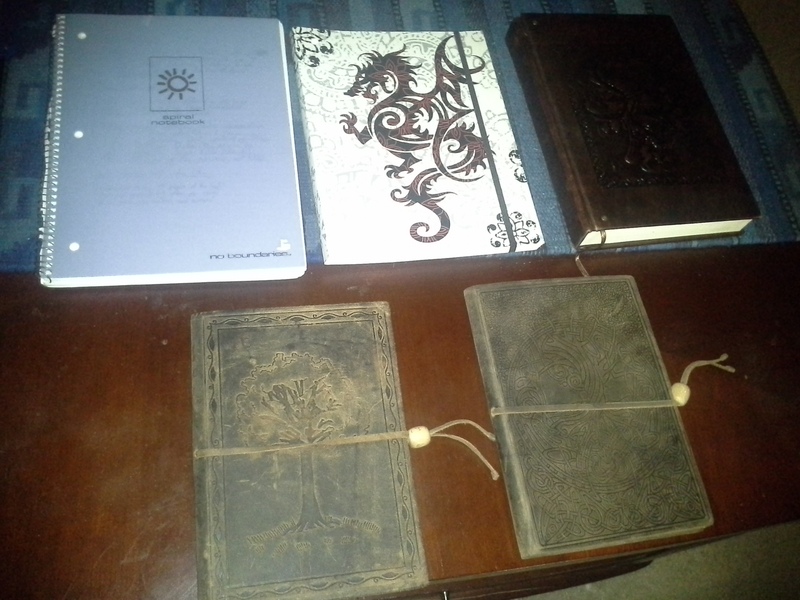 All of my writing journals so far. From top left: TSOD book 1, TSOD book 2, TSOD book 3. From bottom left, TSOD Bible, Chronicles of the Sentinels. The final stages, what I guess you could call “post-writing” (like post-production on a movie) starts with two proofreadings, first on the electronic copy, and then on a printed hard-copy. If I’m satisfied with the second proofread, I then send my novel to any friends willing to ‘beta read’ to get their feedback, and then with their notes and comments in-hand, I do a final proofread. Not sure how many folks I’m supposed to tag, but off-hand there are two I’d like to tag: Ivyon from “Ivy Mosquito” and Victoria from “Coffee, Write, Repeat.” If either of you have already done this before, please put a link in the comments here, I’d love to read your responses! Previous Post50 Followers and Two Award Nominations!Next PostElude is available!